To flush or not to flush? That is the question! An engine flush is something that you may encounter when you take your vehicle in for an oil change. The two usually go hand-in-hand. This is because your engine's oil will need to be replaced after a flush. A lot of people are unaware of what an engine flush is, how it functions and whether it's really necessary. As such, there has been speculation as to whether a vehicle really needs an engine flush. After all they can be expensive. This begs the question, is it really worth the investment for a vehicle owner? Let's start by exploring what this maintenance ritual accomplishes. The term 'engine flush' makes it sound a lot more glamorous than it really is. Basically, some oil is taken out of the vehicle and replaced with an additive that is designed to break down carbon deposits within an engine. The car is then driven around a bit to circulate the additive and ensure that it is spread throughout the system. During this process carbon deposits within the engine are loosened into the oil and trapped in the filter. That's why after an engine flush, the necessary next step is to replace your oil and filter, since they will be carrying the gunk that was previously trapped in your engine. An engine flush should especially be considered if the owner of the vehicle tends to leave oil for a long time in the engine before changing it. 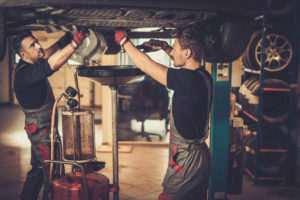 Even if an owner changes their oil often, it is strongly advised that a flush be done after the first eight to ten years of the engine's life. Deposit Removal - Carbon deposits within an engine may affect its efficiency, as well as its overall health. An engine flush helps to remove those deposits to return the engine back to proper working order. New Oil Remains Clean - Car owners might realize that after a couple runs with the vehicle, new oil has a tendency to return to a black color. This might be due to the presence of particulates that an engine flush can get rid. This will ensure that new oil remains new for a longer time period. Cleaner Engine Parts - Most engine parts are bathed in oil in order to protect them. If that oil is dirty, they will be as well. Getting rid of the suspended particulates in oil is part of a flush and can help to control wear and tear on the moving parts of the engine. At the same time this will clean up the engine parts as a whole. Gunk Removal - Filters are notorious for not delivering a very thorough clean. An engine flush can help to get rid of all extra floating gunk that the filter misses in its initial processing of the oil. This results in a much longer lifetime for the engine. An engine flush additive is an important part of the entire process of flushing your engine. It determines the amount of cleaning that you'll see once the additives enters the system. Our Nitro Nine ZP-707 Motor Flush is a great example of a cleaning additive that works not only when it's added, but long after. This is because it prevents the reformation of deposits on the engine for some time. If you're looking for high quality engine flush treatments and additives, see our full lineup of Nitro Nine products today. Discover all of our additives, for both gasoline and diesel engines.